David Johnston Binnie was born in Liverpool in the County of Lancashire, England on 18 August 1886, the only son of Thomas Binnie and Mary nee Livesey. David's parents were farmers in the Cairns District of North Queensland. David Binnie reached state school sixth class standard before entering the Queensland Public Service and receiving appointments in Southern Queensland towns of Boonah, Toowoomba and Rosewood. A baby girl, Myrra Livesey Binnie, arrived in 1914 and her little brother, Thomas David Binnie, in 1916. After David's father died in 1915, his mother Mary joined the household. David was active in the citizen defence force. He served in Senior Cadets and as Area Officer 10B for 2 1⁄2 years. He rose to commissioned rank in Second Light Horse (Queensland Mounted Infantry) at the end of 1912, years before the outbreak of war. On 5 November 1915, a public meeting was held in the Exhibition Hall in Brisbane to initiate a snowball recruitment march. Snowball Marches - named for their ability to gather up men along the way - began with the ‘Cooees’ march from Gilgandra to Sydney in October 1915. The Dungarees was the second of such marches - travelling from Warwick to Brisbane. Twenty-eight Dungarees departed Warwick on 16 November 1915, and 125 Dungarees were welcomed in Brisbane on 30 November 1915. Most expected to serve at Gallipoli, but troops were withdrawn from here by 20 December 1915. The Dungarees were to serve in either the Middle East or the Western Front. Stanthorpe was touted as the starting point for the recruitment march in the initial planning stages. Public meetings were held throughout the district calling for support from communities in providing meals and accommodation, as well as setting up meetings in each town on the planned route. The first public meeting in the Warwick district was held in Pratten, about 30km to the north-west on 6 November 1915. A similar meeting was held in Toowoomba. A recruiting meeting was held at the Stanthorpe Shire Hall on 10 November. Lieutenant David Binnie—who was in charge of the march—indicated his desire to commence at Stanthorpe, but it was later decided to start at Warwick. Eight Stanthorpe men volunteered to join up, taking the train to Warwick in time for the commencement of the march, with a ninth man catching up the following day. 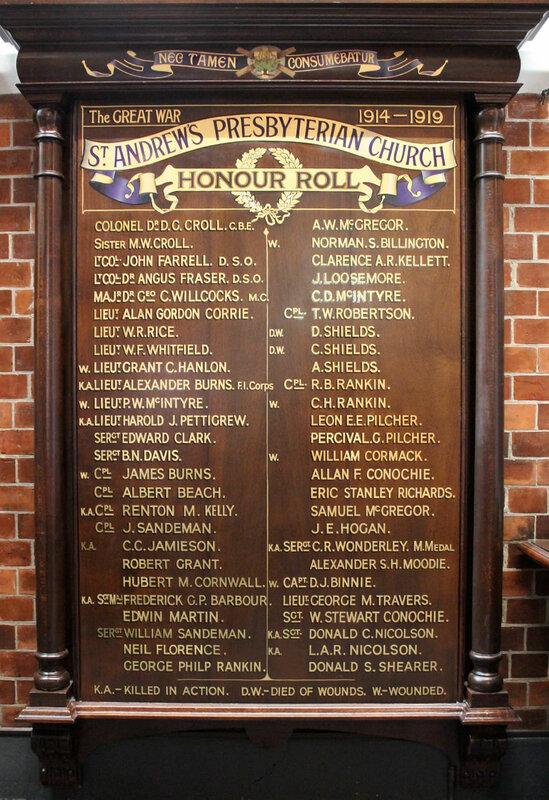 26-28 November 1915 - Ipswich to St Paul's Anglican Church and Town Hall. On the afternoon of 26 November 1915, Ipswich shops and businesses were gaily decorated and closed to allow employees to participate in welcoming the Dungarees. Men from the North Ipswich Railway Workshops had joined in too. A platform was erected in the grounds of St Paul's Church on which ladies of the Patriotic Committee were seated along with local school children. Lieutenant Binnie was pleasantly surprised to find his wife and little daughter Myrra seated amongst the ladies. The school children sang patriotic songs and further speeches were made. The final day's march from Oxley to Brisbane began early on 30 November 1915. Participation from local schools, bands and scouting groups, provided a festive atmosphere for the Dungarees. They stopped for refreshments at Moorooka around 8am and moved on to the Junction Park State School for breakfast by 8.45am. They marched along Ipswich Road reaching the Woolloongabba five-ways at 10.30am. A large crowd gathered and cheers rang out, as did the fog-signals from the trains in the Woolloongabba railway yards (now part of the South East Busway). The Railway Band led the march of the Dungarees down Stanley Street. Enthusiastic crowds gathered in every doorway and veranda, and flags fluttered overhead. At around 11.20am the Dungarees reached the South Brisbane Baths. After a short swim they were provided with soft drinks, cakes and cigarettes. The Governor, Sir Hamilton Goold Adams, met and congratulated the men and marched with them to the Victoria Bridge. On the northern side of the bridge the Dungarees were greeted by the local mayor before a triumphal march down Queen Street accompanied by many khaki-clad troops. Trams were stopped in Queen Street, and people climbed onto them to get a better view. The windows of buildings either side of the street, as well as the roadways, were filled with spectators, as the parade made its way to Albert Square (now King George Square). At the age of 29 years 8 months Lieutenant David Johnston Binnie enlisted to serve overseas in the Australian Infantry Force (AIF). It meant leaving his wife Mildred, his mother Mary and two small children. Lieutenant Binnie was appointed to D Company, 42nd Battalion on 15 April 1916 and was to train at Thompson's Paddock Camp, Enoggera. He embarked for active service abroad on 5 June onboard HMAT Borda from Sydney, disembarking at Southampton on 23 July 1916. He was promoted to Captain on 22 August 1916 and proceeded to France on 25 November. The 42nd entered the frontline for the first time on 23 December 1916. The winter of 1916-­17 was horrendous and Captain Binnie was wounded in action on 20 January 1917. He was admitted to the 10th Australian Field Ambulance with shell shock and multiple wounds but his serious condition required hospital treatment. He was admitted first to 14th General Hospital, Wimereux in France. He was later transferred per hospital ship St Patrick to England where he was admitted to 4th London General Hospital, thence Cobham Hall. On 6 April 1917 he was still suffering from severe shell shock and was discharged from hospital for return to Australia. David left England per Hospital Transport Themistoccles on 4 May 1917, disembarking at Sydney on 4 July. Although his appointment in the AIF was terminated at Brisbane on 9 August 1917, Captain Binnie continued to take an active part in army affairs at Enoggera Camp and at military parades. In a crowded Anzac Square in Brisbane on Anzac Day 1918, he read the names and brave actions of returned servicemen as the Governor Major Sir John Goold-Adams pinned the various medals on each man's coat. David, his wife and young children and David's mother Mary, later lived in Cecil Plains where Mr D J Binnie was appointed to be supervisor of the soldiers' settlement there. While living there, another child, Mildred Evelyn, was born in 1918. Then a most unfortunate episode occurred to cause untold hardship and sorrow. David Binnie was accused of stealing money while employed as a public servant, found guilty and sentenced to three years in prison. The judge stated that Binnie's crime was a breach of the trust imposed on him by the Government. In a request to appeal against the severity of the sentence pleas for leniency were made. (He had suffered severely from shell shock and this had been largely responsible for his lapse.) In view of his good war record and previous good character, the benefits of the probation clause should have been given. But the magistrate did not interfere with the court's decision and the right of appeal was not granted. After serving three years with hard labour in gaol, David Binnie with his wife and children and his mother went to live in New South Wales. He tried farming for a while at Riverstone Station, Quaker's Hill and at Clovelly but David's marriage to Mildred was dissolved in divorce in 1939. In the 1940s he worked as a book-keeper at Gibbonsvale, Kikoira. At the end of the decade he was living at Flour Mill near West Wyalong with no occupation. David Johnston Binnie died at Concord Repatriation Hospital, Sydney on 25 February 1950, aged 63 years. The family funeral notice referred to his loving children, Myrra (then Mrs Lane), Thomas and Mildred. In another notice, members of the 42nd Battalion Association were invited to attend his funeral in honour of their comrade, Captain D J Binnie, 1st AIF.